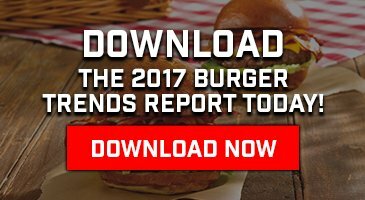 There are a ton of ways you can incorporate bacon and onions into your Burger creation. Whether you’re going for the smoky beauty of onion jam or you just want to pile as much bacon on your Burger as humanly possible, you really can’t go wrong with either—and you definitely can’t go wrong with both. Naturally, we fell in love with this recipe shared with us by Havird Usry, the executive chef and one of the geniuses behind Fat Man’s Mill Café in Augusta, GA. The Usry family has seen Fat Man’s through a number of evolutions since the 1940’s (which we can appreciate, being a four-generation business ourselves). Now run by brothers Brad and Havird, the café serves up a variety of classic sandwiches that every generation can enjoy. 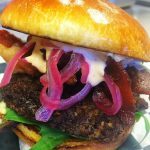 This Burger combines the best of both worlds: sweet maple brown sugar bacon and tangy pickled red onions topping a juicy Burger on a (what else?) brioche bun. It’s perfect for those who like their Burgers with a bit of sweetness, a bit of crunch, and a whole lot of flavor. 1. Pickle your julienned red onions and pan fry 2 pieces of Wright's thick-cut maple brown sugar bacon. After they are prepared, set aside to assemble the Burger later. 2. Season the Schweid & Sons Signature Series: Chuck Brisket ground beef with salt, pepper, and garlic powder and fold in shredded cheddar cheese. Form into one large patty. 3. Cook Burger on medium-high cast iron skillet or grill. You want a good sear on both sides. Cook to medium rare, then let it rest in cast iron or indirect heat on the grill for about 3-4 minutes (depending on heat). 4. Butter your brioche bun and toast to a golden brown. 5. Mix your chipotle mayo and horseradish. Spread it on both sides of your bun. 6. Add your arugula, pickled red onion, bacon. 7. Add LOVE! Add SOUL! Havird, an Augusta GA native, is the executive chef and vice president of Fat Man’s Mill Café & Enterprise Mill Events. He has led and managed major growth in the business over the past 7 years. Hav and Brad thought the next step for their business was to be more culinary based. This led Hav to Helm’s Culinary Institute, where he graduated as an Executive Chef, first in his class. Hav is married to Dr. Brooke Harrison Usry, who has a dental practice in North Augusta, and they have a beautiful daughter, Hudson Grace. They also have a really cool dog named Otis!